Large and modern 3 bedroom house featuring floorboards throughout, 2 living areas, 40" lcd tv, dvd player, fully equipped kitchen incl. dishwasher, dining, 3 way bathroom, main bedroom is huge with king bed tv/dvd and ensuite with spa, laundry w/wash machine & iron, huge covered front deck (with gate to keep toddlers in) and relaxing daybed, barbie on the huge covered back deck that leads out to a tropical bali hut where you can relax in the hammock while taking in lake views. Reading room has a great library with a double daybed to really relax away from the tv. Big front and backyard. Beautiful tropical gardens with lake views. The house is sundrenched all day long with shaded areas on either the front or back decks. Sleeping: Main bedroom with ensuite & spa: 1 king bed, 1 travel cot, TV. 2nd bedroom: 1 queen, dvd player. Bunk room: 1 double, 3 singles (tribunk + bunk). Canoes, tennis rackets, boules and plenty of board games. Ideal for families or groups. Plenty of offstreet parking, easy boat access. boat ramp opp. & Elizabeth Beach boat ramp a 2 minute drive. Outdoor hot shower and toilet, separate outdoor sink for fish cleaning and garden hoses makes cleaning boats (and kids!) a breeze. Facing NNW, overlooking the southern corner of beautiful Wallis Lake with Booti Headland making an imposing backdrop. 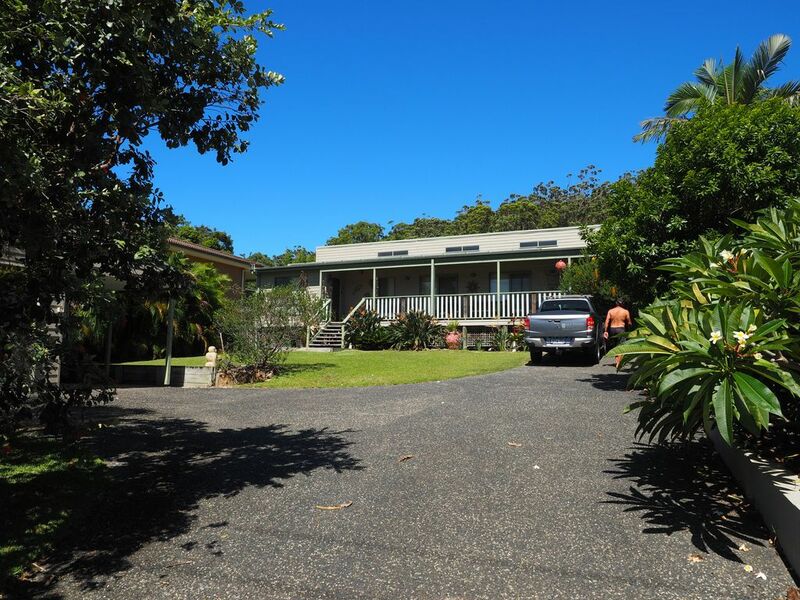 The house sits across the road from the lakefront reserve, boatramp, jetty and recreation club / restaurant. The canoes provided can be carried across the road. It is only a short walk to Elizabeth Beach which is patrolled in Summer and surrounded by rainforest walks. Only a 3 minute drive to Boomerang and Blueys beaches for awesome surfing and dolphin/whale watching. 15 minute drive to Forster. Elizabeth, Boomerang & Blueys Beaches. Boating, canoeing on Wallis Lake, Smiths Lake. Fishing, golf, tennis, bushwalks, 4WDing, scenic flights, birdwatching. Pacific Palms Rec Club on the lake shore is ideal for families. Forster shopping centre 10-15 minute drive. Enough room for the whole family! Great location!! We had a great holiday. The house was fantastic, clean, well equipped and very child friendly. It was great to have a secure yard and room to move about inside and out. My husband loved the boat ramp being close. Wallis lake is lovely and Elizabeth Beach is awesome. We even saw a whale!